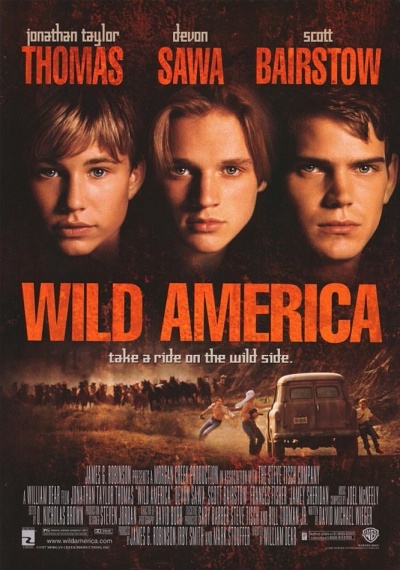 Wild America :: Movie Information :: RabbitTV GO! Jonathan Taylor Thomas (TV's "Home Improvement," "Man of the House"), Scott Bairstow ("The Postman," TV's "Party of Five") and Devon Sawa ("Slackers," "Final Destination") star in the true story of the Stouffer brothers, three boys who leave their rural Arkansas hometown in the summer of 1967 with a used 16mm camera to film endangered wildlife. Encounters with rampaging moose, deadly crocodiles and a den of wild grizzly bears are only some of the hair-raising adventures the three boys experience on their perilous and heartwarming journey to become America's premier naturalist filmmakers. Co-starring Tony-nominee Jamey Sheridan (TV's "Law & Order: Criminal Intent," "Life as a House") and Frances Fisher ("True Crime," "Unforgiven"). Directed by William Dear ("Angels in the Outfield," "Harry and the Hendersons"). Look for an uncredited cameo by "Lethal Weapon" star Danny Glover!